Happy Thursday, everyone. 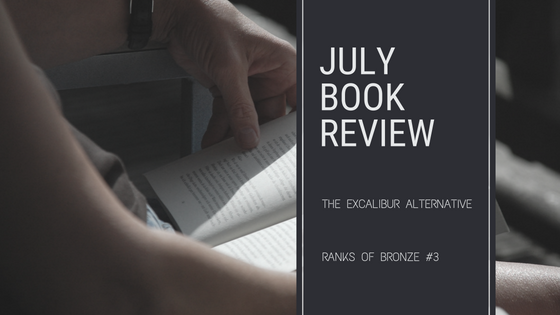 Here is July's book review for general consumption. Since the book I am reviewing is the third in a series, a potential SPOILER WARNING is in effect if you have not read the Ranks of Bronze series. 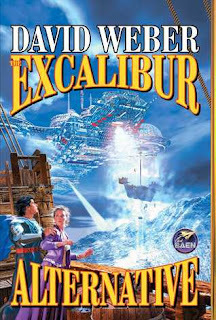 It's just another day at war for Sir George Wincaster and the group of 14th-century English soldiers he leads until they are abducted by aliens who are part of the Galactic Federation. Stuck in outer space and used as mercenaries to conquer the populations of low-tech planets, they wonder if they will ever make their way home. An unexpected opportunity comes their way when a member of another alien race, who is also being subjugated by the Galactic Federation, approaches Sir George with a proposition to take over the ship and win back their freedom. Will he take them up on it, and what will the consequences be? I confess, I did it again. Started reading a book in the middle of a series. When am I going to learn my lesson? Seriously, though - although this novel is part of a series, it reads much like a standalone (something I often appreciate in a series of stories). In some ways it is. While this story is part of the series, it fleshes out some of the history that comes up in previous books. The Excalibur Alternative was a bit of a slog, which made it fairly easy to set aside when writing deadlines and other things came up. Weber spends more time than necessary on details that are not essential to building the world or moving the story forward. This book reads like a well-polished world-building exercise. With the plot points it had and how they were executed, it could easily have been a novella or a short story and still worked. Also, the reactions of characters to their situation at times seemed off-beat - not so much the leader of the alien race that kidnapped Sir George and his men as the men underneath Sir George's command. I get that advanced technology can inspire fear and a certain amount of obedience, but something about their mental state in the situation they were in did not seem right, and I'm not sure I can put my finger on exactly what. It was hard to connect with the characters and their plight because of it. After writing this review, I went back to see what other reviewers said about it. One of them noted that this was an expansion of a story that had been included in an anthology of short stories in the Ranks of Bronze world. That would explain why I felt like it would have worked as a short story. Overall, this was not the best of introductions to David Weber's work. I'm not writing his other stories off completely, but I am hesitant to pick up anything else by him at this point.